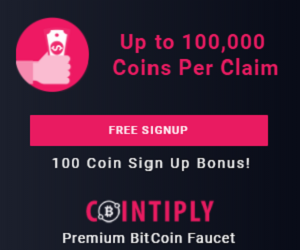 Cointiply is a site where you can play games, mine, watch videos, answer surveys or just use the faucet! This is a great way I semi passively earn quite a bit. You can run the videos in a browser off to the side while you do other things, leave it open when you run to the store really quick, up to you! Easy and quick earning by watching videos. Bitcoin Faucet - Earn up to 100,000 coins with every spin from the highest paying Bitcoin faucet. Loyalty bonus of 1% per day up to 100% for every day you make a claim. Earn up to 25% lifetime referral commissions. Earn a bonus when you roll a prime number. I do this at least daily, it really adds up with the video earnings. Get rewarded in Bitcoins for your in-game activity. Games work on mobile & desktop. 16 offer walls with more being added all the time. Watch short videos and earn Bitcoin. Complete short surveys for huge Bitcoin rewards. Install mobile apps and receive Bitcoins. They have a high quality mining game! Purchase & upgrade buildings with your coins. Earn coins every hour from your Cointiply Mine and from the Bonus Mining Pool. Win random prizes for having an active Cointiply Mine. Coming Soon: Compete against other players for the best mining claims. They payout to BTC address, DOGE address or FaucetHUB.